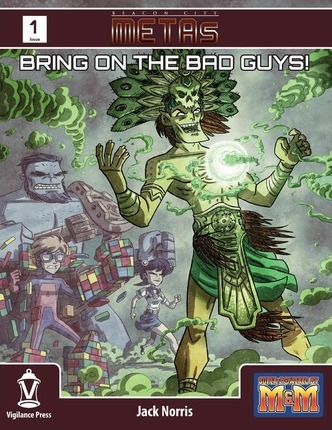 Beacon City Metas : Bring on the Bad Guys! Attention: Have your security clearance clearly visible at all times! The Metahuman Evaluation and Tracking Authority was instituted to keep track of the powerful beings who took the world of Beacon City by storm. It collects data from a number of sources and shares it between various law enforcement agencies and the military. Now, with this first dip into the METAs database, we present you with a new resource for characters for your games... your fellow players from around the globe! Welcome to METAs, a series of supplements for Mutants and Masterminds featuring characters submitted by players just like you! To start you off, issue one features eight fully-statted and illustrated characters, including color commentary from METAs personnel. If that wasn't enough to pique your interest, we included a 5-page article from Maestro Game Designer Jack Norris on how to run a Villainous campaign, "Bring on the Bad Guys!" With this information at your disposal, feel free to drop these heroes and villains into your game and use them however you wish. There are heroes in here for you to add to your campaign's background as allies for your players, and some characters who would easily be used as villains as well. Or flip things around and have your players take on the roles of villains, and use these and other heroes against them! Special highlights in this issue include contributions from Leon Chang, Rick Jones (Due Vigilance: Six Gun) and Steve Perrin (Amazing Stories of WWII: Homefront Heroes, and Homefront Villains)! Illustrations are courtesy of Alex Williamson, Jesse Justice, Denise Jones, and Dan "Alien Mastermind" Houser. From the childlike antics of Kid Awesometastic to Mictantlocan, a sinister avatar of death, you're sure to find some surprises inside the METAs database. Stay inside the clearly marked areas, and do not attempt to remove any files from the secure zone. Any copies must be verified by the attending clerk. Thank you for joining METAs!